Hell Within started in 2002 with five musicians whose only concern was making heavy and aggressive metal. It took the band 2 years of playing the local Massachusetts circuit and doing self financed east coast tours for Hell Within to get the attention of up and coming record label Lifeforce Records. 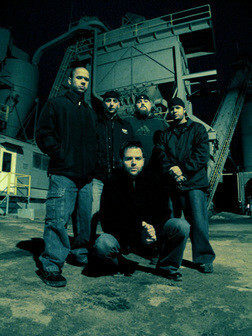 Hell Within signed with Lifeforce Records in July of 2004 and started the writing process for their debut album. The band hit the studio in November of 2004 with producer John Ellis of Prism Sound in Acton, MA to record the album. Once the recording was complete the album was brought to Zeus (Hatebreed, Shadows Fall, Madball) at Planet Z studios in Hadley, MA for the mixing. Alan Douches (Unearth, God Forbid, From Autumn To Ashes) of West Westside Studio took the driver’s seat of mastering the album. Lastly, Mario Gaza at Robot Plague designed the artwork and the album was ready for release. The band’s debut album “Asylum of the Human Predator” was released worldwide in April of 2005. Once the album hit the streets the band set off non-stop touring in support of their new effort. Hell Within participated in 3 full U.S. tours and 5 east coast tours. Touring with such bands as Manntis (Century Media), God Dethroned (Metal Blade), Nightrage (Century Media/ Lifeforce Records), Thine Eyes Bleed (The End Records), Byzantine (Prosthetic Records), The Autumn Offering (Victory Records), The Human Abstract (Hopeless Records), etc..
On an intermission between all the rigorous touring Hell Within enlisted the talent of Ian McFarland (Messuggah, Agnostic Front, Cannae) of Killswitch Productions to shoot the first music video. Ian and Hell Within decided that “Bleeding me Black” from “Asylum of the Human Predator” was the best candidate for the video. The video hit the air waves in the spring of 2006. After the tour cycle for “Asylum of the Human Predator” ended, the band retired to the rehearsal room to start writing their sophomore release. Hell Within worked on the album for 5 months and then hit the studio yet again with producer John Ellis. Once the tracking of the album was complete, it was time to mix the new offering. Hell Within took the new record to well known engineers Mark Lewis and Jason Suecoff at Audio Hammer Studios to mix the yet untitled release. Lastly, Hell Within’s new record made its last stop at Morris Sound in Tampa to be mastered by Tom Morris. Once the audio production was complete, The band contacted Paul Romano (Mastadon, Trivium, etc..) to put the finishing touches on the album by designing the artwork. Hell Within’s new album “Shadows of Vanity” hit the streets in May of 2007 and was very well received by fans. Yet again it was time for the band to hit the road in support of the album. Hell Within supported their new effort with two full U.S. tours and 3 East coast tours since “Shadows of Vanity’s” Release, touring with bands such as Forever in Terror (Metal Blade) and Ashes Of Your Enemy (Crash Music Inc.). Hell Within is gearing up to head back out on the road with current label mates Hand to Hand for yet another full coast to coast U.S. tour. Hell Within is a band that perseveres throughout anything that is thrown their way. No matter what the obstacle, the band will always continue writing great metal music and tour with the integrity that has become a way of life.